He's running from his past, she's chasing her future. Lied to by her father, abandoned by her mother, and determined to keep her promise to a dying sister. Rachel Stanley, feels lost and afraid after saying a final farewell to her beloved sister. She is truly alone in the world, and must travel west disguised as her sister, to marry one of two men, she's never met. Rachel knows who's to blame for her miserable and empty life. She wants revenge. Not only for herself, but for the loss of her beautiful sister. What she needs to make it happen, she can't do alone. She needs help and hopes to find it in the man she’ll be marrying in Jubilee Springs. Tired of living in the company’s bunkhouse with the other miners. Beg Wilson decides to take his bosses up on their generous offer of finding wives for their workers, and take advantage of the provided lodgings that came with it, by puts his name down to receive a mail order bride. He's never really had a home and is determined to shake the ghost of his past, hoping to find a future with the woman whose letters move him, and make him think a good life is possible. He'll finally be able to plant roots and have a normal family life. The only trouble is, his bride is not who she says she is. Rachel and Beg are on a collision course, where his past and her future will merge into one. What Rachel's running away from, is what Beg is trying to forget. Destiny demands has fated they do it together, bringing with it bittersweet memories, hurt feelings, peace of mind and new beginnings. Can two lost soul heal each other and find happiness? Find out now by grabbing your copy of Gambled Pride on Amazon today. PLEASE CLICK HERE. 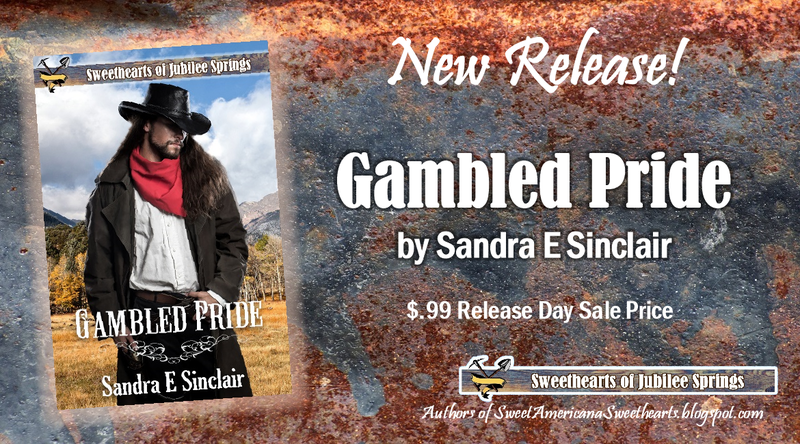 Gambled Pride will be offered at the New Release sale price of $.99 for one day before it will be available at its usual price. The air was still, the night had a nip in its tail as it pinched at Rachel Stanley’s skin, leaving kiss bumps in its trail. Rachel shivered and wrapped the thin shawl tightly around her. Steam from her breath wafted through the air as she raced along the lonely streets, keeping close to the shadows cast by the moonlight. She had to get to her sister Marybeth. She’d know what to do. Their father had gone too far this time. Her tears rolled unabated as she cried, cold and wet on her cheeks. What should she do? Panic gripped her soul as she relived what her father had told her, so matter-of-fact, as if her feelings counted for nothing. She picked up speed with every nerve-shattering sound that reached her ears, breaking through the noise of her pumping heart, which echoed, thumping against her eardrums. Her eyes shifted this way, then that, making sure she wasn’t seen, in case Red Adams decided to claim his prize earlier than the date stated. 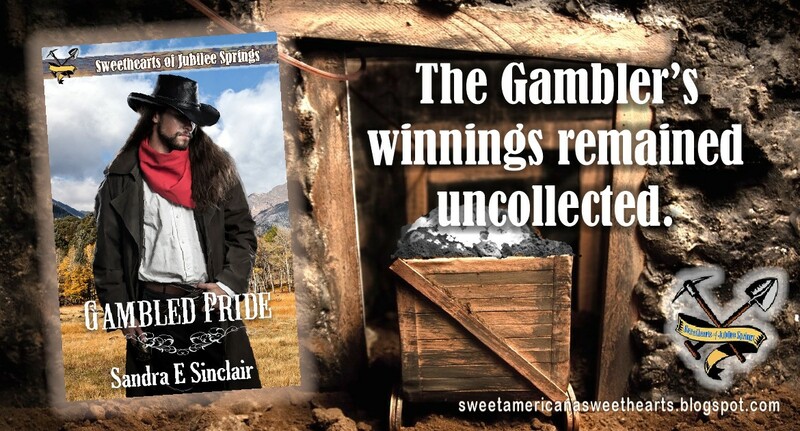 Their father’s gambling had already sealed Marybeth’s fate. She wasn’t going to let him ruin her life and reputation in the same way. Maybe things wouldn’t have gotten so bad if Marybeth hadn’t become sick. Without her money coming in too, what she made from cleaning other people’s houses, taking in their mending and laundry wasn’t enough to sustain their father’s addiction. So now he wanted her to work for Red too. Marybeth had only been a dancing girl but her chances of finding a good man to marry were over. 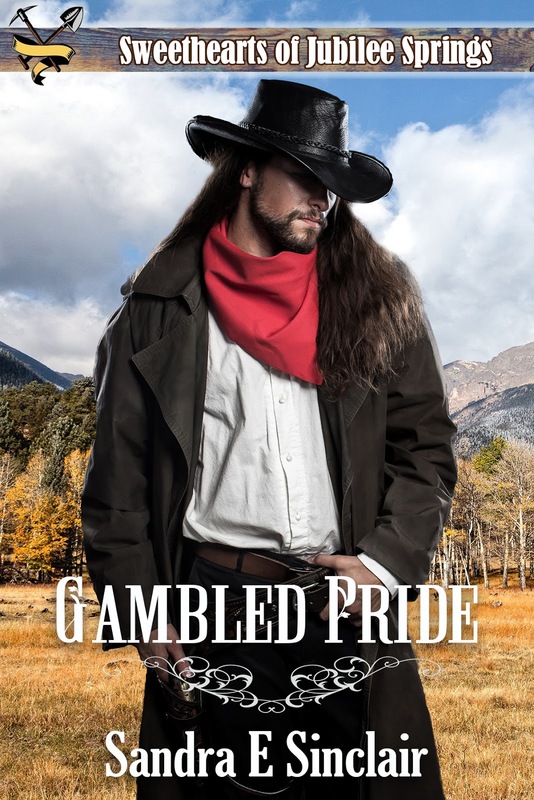 No decent man was going to marry her sister, knowing she’d let strange men paw her and swirl her around the saloon night after night. Rachel quickened her stride. Marybeth had told her, if ever the day came when their pa decided to make her work for Red, Rachel should run—run and never look back. But how could she leave with Marybeth being sick up at the hospital? Her big sister was all she had in the world, and she’d never leave her; never. Marybeth was more than a sister, she was her friend, her mother, and her protector from a drunken, brutish father who showed them no love after their mother ran out on him; leaving the girls behind. Rachel had only been little when their mother left, but Marybeth had told her stories to remind her of how loving their mother was and how much she loved them. But she couldn’t take them with her, or their father would never stop looking for her. And when he found her, he’d kill her. The law would do nothing about it, because he’d make sure they never found her body. She told Rachel how their mother had cried the day she left, wishing she could take them with her. She was heading farther west, to marry a man she’d never met, who had two boys, leaving her sister with instructions to do the same when she became of age and to take Rachel with her. “Ma left us so she could live. So, you have to be good, Rachel, you have to do all he says so he doesn’t hurt us the way he used to hurt Ma,” Marybeth had said. “When is she coming back for us?” she’d asked with the innocence of her childhood. But it hadn’t been all right. Although Rachel guessed if Marybeth had been an only child, maybe her life with Pa would have been different. Then again, Marybeth had been seven years older, and at the age of twelve she knew how to be the way their father wanted her to be. A naive five-year-old hadn’t known. She’d gotten herself into all manner of mishaps, and Marybeth took her punishment. She’d tried so hard to be good and didn’t get it until she was a lot older. By then Marybeth bore the scars that were meant for her. Rachel loved her sister and curbed her tomboy, troublesome ways to save Marybeth from any more of her father’s abuse. It had taken time, but she couldn’t watch her sister suffer any longer. Her cooking and cleaning skills improved with age. She stopped burning their meals and ruining the clothes they took in for laundry. Her needlework was good enough for Marybeth to leave her alone to get on with the jobs they took into their home. It meant she could work outside to bring in extra income for their father to gamble away. Before she became sick, Marybeth had told her they would both be free soon. She’d promised Rachel they were going to live far away from their father, someplace he’d never find them. She had plans. Those plans were quashed by her illness, though. The entrance to the clinic was in sight. She’d see Marybeth and tell her what their father had planned for her and ask her sister’s advice. She didn’t know where to go without money, or a place safe from their father’s reach. Perhaps with things being what they were, Marybeth would share her plans with her and they’d leave together tonight—after all, her father said Marybeth’s health had improved. She was desperate. Marybeth had told her working for Red was hell on earth, and every Sunday at church, her sister prayed for a different and better life. Her prayers were answered from something someone had left behind on the pew. Marybeth had picked it up and chuckled. Rachel had been confused as to whom Marybeth had been speaking to, she understood her thanking the Lord, but aside from the preacher, they had been the only other people left in church. Reaching the clinic, she slipped in through the door out of the encroaching cold. Rage flew throughout her being. Her father had come home and lied to her. He’d told her, her sister’s condition had much improved and she should be coming home soon. He’d even tried to keep her from visiting Marybeth today, saying there was no need if her sister was coming home. He’d given her a million and one chores to do in preparation for Marybeth’s return. The only reason she’d disobeyed him was because he’d said with Marybeth unable to work at the saloon anymore, she’d have to take her place until her sister recovered. When he’d added, Marybeth had arranged it with Red, Rachel knew he’d lied. Marybeth had always told her to run if he even suggested she work there. 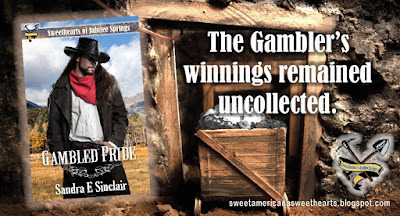 She’d challenged him, saying Marybeth would never do such a thing, and he’d laughed. The man was despicable, she hadn’t thought him capable of lying about Marybeth’s condition. Now the doctors said her sister was dying. If Marybeth died, she might as well die too.